Rimilia delivers software solutions but managing director Chris McGibbon needed his own funding fix to transform his company’s fortunes. That was seven years ago and new projects about to be launched are set to deliver a huge boost to turnover. ”The Pension-led funding has allowed us to take the brakes off and attack a number of opportunities at the same time which is making for a much more prosperous future,” said managing director Chris. The good news is not confined to the home market but overseas as well, with the “green shoots” of a US customers base blossoming with an investment in an established US data centre already paying off. Rimilia has yet to market itself or its business solutions across the Atlantic but has already attracted three new customers through referrals and people coming to their website. Back in 2008 things were different. Chris was turned away by the banks following four years of work to develop computer software to solve the manually-intensive process of matching customer payments with invoices. Rimilia was ready to grow but needed working capital and the traditional lenders did not share the vision. The company’s only significant assets were its software licenses but these were unvalued at the time and around £500,000 of funding was needed. Step in an adviser at Black Country Reinvestment Society who introduced Chris to pensionledfunding.com. Following an independent valuation of Rimilia’s intellectual property, the money from Chris’s pension was invested in the company. Chris admitted he was apprehensive at first as he turned to his pension pot for vital funding to push the company forward. The cash injection has been used to bring on a new team of developers to build fresh solutions, increasing customer support and setting up a new account management team. 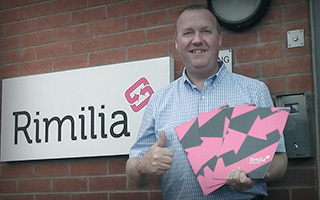 Staff numbers have increased from 24 last year to 32 and Rimilia are about to outgrow their existing base in Bromsgrove. ”Our target market is any organisation that has a growing customer base which drives volumes of invoices and payments, if these fall into the SME bracket, then it will benefit them no doubt,” said Chris. Rimilia was set up in 2008 to develop computer software to solve the manually-intensive process of matching customer payments with invoices. Chris and his team spent four years developing the software solutions but working capital was needed before Rimilia could grow and prosper. Despite all the hard work, Chris was turned away by the banks. The company’s only significant assets were its software licenses but these were unvalued at the time and around £500,000 of funding was needed. Step in an adviser at Black Country Reinvestment Society who introduced Chris to pensionledfunding.com. Following an independent valuation of Rimilia’s intellectual property, the money from Chris’s pension was invested in the company. Now the business has a new team of developers working on new projects, the support and account management team has increased, the US market is opening up and turnover is predicted to rise by more than 50 per cent to existing customers alone. “The Pension-led funding has allowed us to take the brakes off and attack a number of opportunities at the same time which is making for a much more prosperous future,” said Chris.